This paper deals with a percussive rock surface crusher driven with a solenoid to smoothen the sample surface by a 2-axis planar motion. The weathered rock surface should be removed and smoothened before analyzing its structure and composition precisely. The solenoid, which generates a large vibration amplitude and a large impulsive force, was used to vibrate a tool bit with engineered 1-mm pyramids made of tungsten carbide. The tool bit was fixed parallel to the feed direction or with a skew. A rock sample was moved by a stage with movable ranges for the machining of 10 mm and 20 mm in the x– and y-directions, respectively. The sample paths were randomly generated in 1 or 2 directions. 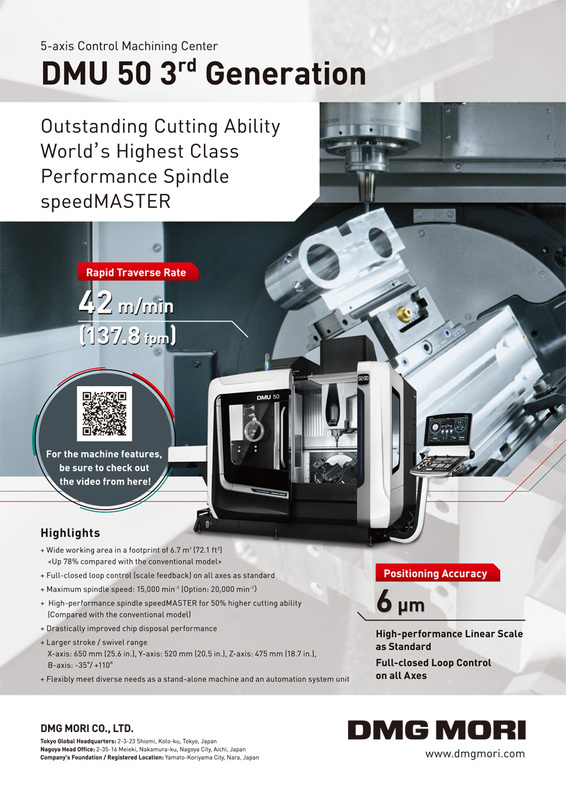 In the comparisons of the surface roughness, the 2-axis motion and tool skew not only allowed isotropic and small roughness but also the removal of more amount due to the removed debris. The roughness reached several tens of micrometers without a certain special frequency component. This level allows for component analysis by X-ray fluorescence or laser-induced breakdown spectrometer. K. Furutani and H. Kamiishi, “Percussive Rock Surface Remover Driven by Solenoid with Planer Motion for Lunar Exploration,” J. Robot. Mechatron., Vol.29, No.5, pp. 911-918, 2017. H. Kitamoto, H. Omori, H. Nagai, T. Nakamura, H. Osumi, and T. Kubota, “Propulsion Mechanism for a Lunar Subterranean Excavator Using Peristaltic Crawling,” J. Robot. Mechatron., Vol.25, No.3, pp. 466-475, 2013. K. Iizuka, T. Sasaki, H. Hama, A. Nishitani, T. Kubota, and I. Nakatani, “Development of a Small, Lightweight Rover with Elastic Wheels for Lunar Exploration,” J. Robot. Mechatron., Vol.24, No.6, pp. 1031-1039, 2012. T. Hirabayashi, “Examination of Information Presentation Method for Teleoperation Excavator,” J. Robot. Mechatron., Vol.24, No.6, pp. 967-976, 2012. R. P. Mueller and P. J. van Susante, “A Review of Extra-Terrestrial Mining Robot Concepts,” Proc. 2012 Earth and Space Conf., Pasadena, CA, USA, pp. 295-314, 2012. K. Zacny, J. Wilson, P. Chu, and J. Craft, “Prototype rotary percussive drill for the Mars Sample Return mission,” Proc. 2011 IEEE Aerospace Conf., Big Sky, MT, USA, pp. 1-8, 2011. H. Yano, T. Kubota, H. Miyamoto, T. Okada, D. Scheeres, Y. Takagi, K. Yoshida, M. Abe, S. Abe, O. Barnouin-Jha, A. Fujiwara, S. Hasegawa, T. Hashimoto, M. Ishiguro, M. Kato, J. Kawaguchi, T. Mukai, J. Saito, S. Sasaki, and M. Yoshikawa, “Touchdown of the Hayabusa Spacecraft at the Muses Sea on Itokawa,” Science, Vol.312, No.5778, pp. 1350-1353, 2006. K. Zacny, G. Paulsen, K. Davis, E. Mumm, and S. Gorevan, “Honeybee Robotics Planetary Drill Systems,” Proc. 39th Lunar & Planet. Sci. Conf., The Woodlands, TX, USA, p. 1355, 2008. Y. Gao, A. Ellery, M. Jaddou, J. Vincent, and S. Eckersley, “Planetary Micro-Penetrator Concept Study with Biomimetic Drill and Sampler Design,” IEEE Trans. Aerosp. Electron. Syst., Vol.43, No.3, pp. 875-885, 2007. X. Bao, Y. Bar-Cohen, Z. Chang, B. P. Dolgin, S. Sherrit, D. S. Pal, S. Du, and T. Peterson, “Modeling and Computer Simulation of Ultrasonic/Sonic Driller/Corer (USDC),” IEEE Trans. Ultrason. Ferroelectr. Freq. Control, Vol.50, No.9, pp. 1147-1160, 2003. X. Li, P. Harkness, K. Worrall, R. Timoney, and M. Lucas, “A Parametric Study for the Design of an Optimized Ultrasonic Percussive Planetary Drill Tool,” IEEE Trans. Ultrason. Ferroelectr. Freq. Control, Vol.64, No.3, pp. 577-589, 2017. Y. Wang, H. Li, D. Bai, Q. Quan, H. Yu, D. Tang, and Z. Deng, “A Rotary-Percussive Ultrasonic Drill for planetary rock sampling,” Proc. 2016 IEEE/RSJ Int. Conf. Intell. Rob. Syst. (IROS), Daejeon, South Korea, pp. 2966-2971, 2016. D. Jie, P. Li, Q. Quan, S. Jiang, X. Hou, D. Tang, and Z. Deng, “Optimization of percussive mechanism in rotary-percussion drill for lunar exploration,” Proc. 2013 IEEE Int. Conf. Rob. Biomimetics (ROBIO), Shenzhen, China, pp. 2130-2135, 2013. K. Klein, M. Badescu, N. Haddad, L. Shiraishi, and P. Walkemeyer, “Development and testing of a rotary percussive Sample Acquisition Tool,” Proc. 2012 IEEE Aerospace Conf., Big Sky, MT, USA, pp. 1-9, 2012. F. Liu, M. Trkov, J. Yi, and N. Gucunski, “Modeling of pure percussive drilling for autonomous robotic bridge decks rehabilitation,” Proc. 2013 IEEE Int. Conf. Autom. Sci. Eng. (CASE), Madison, WI, USA, pp. 1063-1068, 2013. D. Inoue, Y. Yanagihara, H. Ueno, and S. Nishida, “Model Tests of Regolith Packaging Mechanism,” J. Robot. Mechatron., Vol.24, No.6, pp. 1023-1030, 2012. S. P. Gorevan, T. Myrick, K. Davis, J. J. Chau, P. Bartlett, S. Mukherjee, R. Anderson, S. W. Squyres, R. E. Arvidson, M. B. Madsen, P. Bertelsen, W. Goetz, C. S. Binau, and L. Richter, “Rock Abrasion Tool: Mars Exploration Rover mission,” J. Geophys. Res., Vol.108, No.E12, 8068, Doi: 10.1029/2003JE002061, 2003. C. B. Dreyer, K. Zacny, R. C. Anderson, G. K. Paulsen, J. Skok, J. P. H. Steele, and J. Schwendeman, “The In Situ Automated Rock Thin Section Instrument (IS-ARTS),” Proc. Int. WS Instrumentation for Planetary Missions, #1069, 2012. J. R. Schwendeman, C. B. Dreyer, and J. P. H. Steele, “Design Considerations for Development of a Wire-Based Rock Cutting Mechanism for Space Exploration,” Trans. ASME, J. Mech. Des., Vol.132, No.1, p. 111010, 2010. C. B. Dreyer, J. R. Schwendeman, J. P. H. Steele, T. E. Carrell, A. Niedringhaus, and J. Skok, “Development of a thin section device for space exploration: Rock cutting mechanism,” Adv. Space Res., Vol.51, No.9, pp. 1674-1691, 2013. G. Paulsen, K. Zacny, C. B. Dreyer, A. Szucs, M. Szczesiak, C. Santoro, J. Craft, M. Hedlund, and J. Skok, “Robotic Instrument for Grinding Rocks Into Thin Sections (GRITS),” Adv. Space Res., Vol.51, No.11, pp. 2181-2193, 2013. K. Furutani, E. Ikeda, T. Okada, K. Saiki, and H. Ohue, “Prototype Design of Wire-sawing Machine for Preliminary Experiments to Lunar and Planetary Exploration,” Mater. Sci. Forum, Vol.773-774, pp. 392-399, 2013. A. Cardoni, P. Harkness, and M. Lucas, “Ultrasonic rock sampling using longitudinal- torsional vibrations,” Ultrason., Vol.50, No.4-5, pp. 447-452, 2010. K. Furutani and E. Kagami, “Machining of Rock Surface Shaver with Piezoelectric Actuator for In-situ Analysis in Lunar and Planetary Exploration,” Int. J. Automation Technol., Vol.10, No.4, pp. 533-539, 2016. K. Furutani and Y. Tagata, “Basic structure of small vibratory crusher for planetary exploration,” J. Jpn. Soc. Appl. Electromagnetics and Mechanics, Vol.17, No.2, pp. 379-384, 2009 (in Japanese). 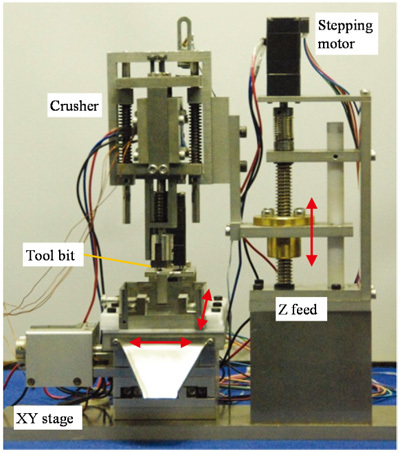 K. Furutani and Y. Tagata, “Development of Small Vibratory Crusher for Sample-return Mission,” Proc. 2007 Ann. Meet. Am. Soc. Precis. Eng., Dallas, Texas, USA, pp. 236-239, 2007. K. Furutani, H. Kamiishi, Y. Murase, T. Kubota, M. Ohtake, K. Saiki, T. Okada, H. Otake, C. Honda, H. Kurosaki, T. Sugihara, and T. Morota, “A Prototype of Percussive Rock Surface Crusher Using Solenoid for Lunar and Planetary Exploration,” Proc. Int. Sympo. Artificial Intell. Rob. Autom. in Space (i-SAIRAS 2012), Turin, Italy, P.18, pp. 1-8, 2012. T. Okada and Y. Kuwada, “Effect of Surface Roughness on X-ray Fluorescence Emission from Planetary Surfaces,” Proc. Lunar and Planetary Science XXVIII, #1708, 1997. Y. Maruyama, K. Ogawa, T. Okada, and M. Kato, “Laboratory experiments of particle size effect in X-ray fluorescence and implications to remote X-ray spectrometry of lunar regolith surface,” Earth Planets Space, Vol.60, No.4, pp. 293-297, 2008. J. Naranen, H. Parviainen, K. Muinonen, J. Carpenter, N. Kim, and M. Peurac, “Laboratory studies into the effect of regolith on planetary X-ray fluorescence spectroscopy,” Icarus, Vol.198, No.2, pp. 408-419, 2008. S. Maurice, R. Wiens, G. Manhes, D. Cremers, B. Barraclough, J. Bernardin, M. Bouye, A. Cros, B. Dubois, E. Durand, S. Hahn, D. Kouach, J.-L. Lacour, D. Landis, T. Moore, L. Pares, J. Platzer, M. Saccoccio, B. Salle, and R. Whitaker, “ChemCam Instrument for the Mars Science Laboratory (MSL) Rover,” Proc. Lunar and Planetary Science XXXVI, #1735, 2005. J. R. Thompson, R. C. Wiens, J. E. Barefield, D. T. Vaniman, H. E. Newsom, and S. M. Clegg, “Remote laser-induced breakdown spectroscopy analyses of Dar al Gani 476 and Zagami Martian meteorites,” J. Geophys. Res., Vol.111, No.E05, E05006, doi:10.1029/2005JE002578, 2006.